I'll be honest: I never really got into watching all the classic Christmas specials when I was younger. I only remember watching Rudolph the Red-Nosed Reindeer, Frosty the Snowman & The Little Drummer Boy once or twice when I was about 4, but I never watched A Charlie Brown Christmas or How the Grinch Stole Christmas!. In fact, the only Christmas special I really want to watch is The Star Wars Holiday Special. But I have seen my fair share of Christmas movies, like A Christmas Story & Home Alone. 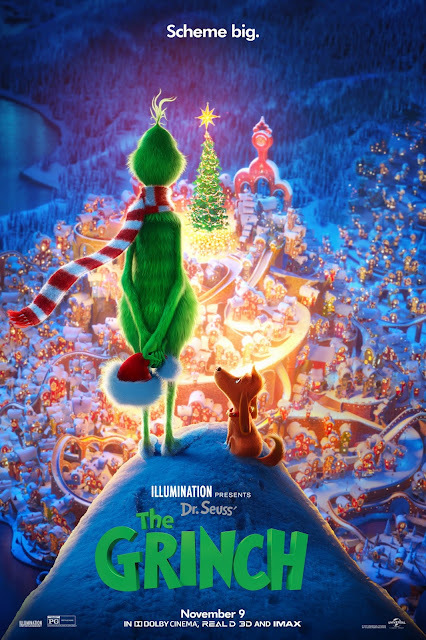 The Grinch isn't perfect, but it's an enjoyably good Christmas family film. Based on the 1957 book How the Grinch Stole Christmas! by Dr. Seuss, the film follows The Grinch (voiced by Benedict Cumberbatch), the infamous hater of Christmas from just north of Whoville. Living alone with his dog Max, The Grinch hates Christmas with all of his being, possibly because his heart is 2 sizes too small. Mayor McGerkle (voiced by Angela Lansbury), the mayor of Whoville, has called for Whoville's Christmas to be 3 times larger this year, for which jolly citizen Bricklebaum (voiced by Kenan Thompson) is leading the way. The Grinch, absolutely displeased by this, concocts a scheme to steal the presents from all the houses in Whoville while dressed as Santa Claus, in the hopes of ruining Christmas for Whoville. Meanwhile, young Cindy Lou Who (voiced by Cameron Seely), wishes to meet Santa Claus to thank him for helping her mother Donna (voiced by Rashida Jones) every Christmas. While trying to meet Santa Claus, she uncovers The Grinch's plan. Along the way, The Grinch will hopefully learn the true meaning of Christmas. The cast is amazing. Benedict Cumberbatch has a lot of fun with his role, & his voice perfectly fits the character. The rest of the voice cast, especially Thompson & Seely, do great jobs as well. But this belongs to Cumberbatch, & he runs with it. The direction by Scott Mosier & Yarrow Cheney is great. Although there's some usual debut bumps, they overcome those bumps with a lot of heart. The screenplay by Michael LeSieur & Tommy Swerdlow is very good. Although the plot doesn't add anything new to the story, the characterization is excellent, & the dialogue is very humorous. And the animation is wondrous. The animation is very colorful & very attentive to detail, adding up to what is one of Illumination's best efforts when it comes to the creation of the animated world of the film. This is a solid animated film. It's not a masterpiece, but it might just be enough to make your heart grow 3 sizes bigger. The Grinch was seen by me at the MJR Marketplace Digital Cinema 20 in Sterling Heights, MI on Friday, November 9, 2018. It is in theaters everywhere. Its runtime is 86 minutes, & it is rated PG for brief rude humor.